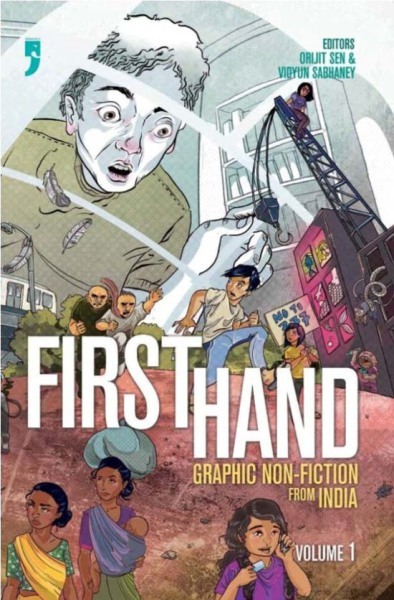 First Hand Volume I, a collection of new non-fiction graphic narratives, features works by independent writers, artists, reporters, activists, researchers, designers, anthropologists, academicians, and film-makers based in India, who comment on and describe their world through comics in six genres: biography, autobiography, oral history, documentary, commentary, and reportage. By combining image and word to tell stories that range from urgent contemporary narratives to more exploratory historical perspectives to simply the extraordinary lives of ordinary people, the book offers new worlds through which we can re-enter our won. Whether it be reporting the murder of an RTI applicant, or an account of the Gujarat riots, or a biography of Begum Akhtar, or a narrative about becoming familiar with one’s city through the use of its public transport system, each comic tells the story of an Indian reality, bringing alive what has only been encountered in word till now, visually.